Change is the most dominant business trend in Canada through 2018. NAFTA and USMCA trade and tariff uncertainity, technology innovation and the threat of disruptors, on again, off again pipelines, the spectre of significant tax changes here and abroad, new data breach regulations and data privacy concerns, cannabis legalization and its impact workplaces and a host of other concerns are all current and significant unknowns affecting businesses in Canada. 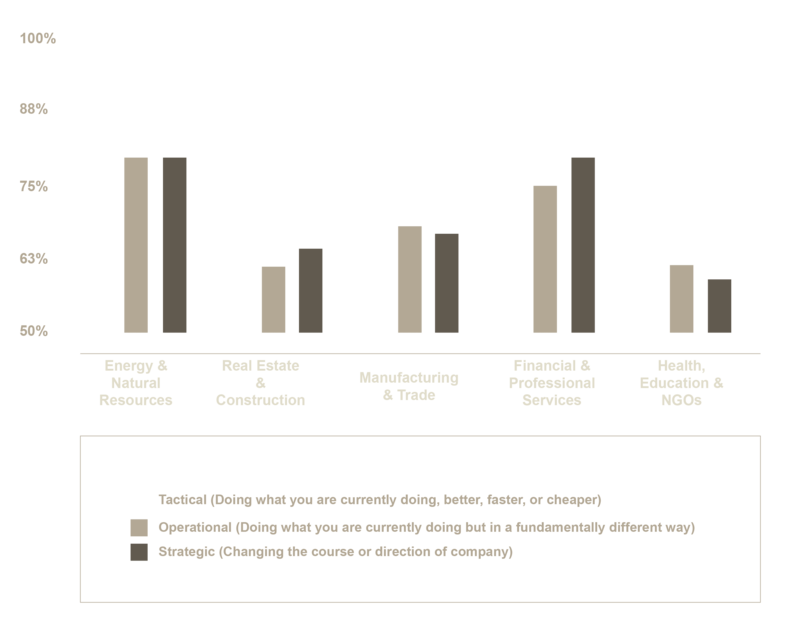 Over the last year, MNP has been studying the impact this degree of change is having on organizations. We want to help our clients understand and ultimately find ways to benefit from the forces of change they face. Our 2018 National Business Leaders survey asked 1,200 Canadian decision-makers across multiple industries to tell their stories and help us better understand the issues of change and innovation. The survey results tell a bold story of transformative change occurring at a fast and furious pace, spurred on by technology. Canadian organizations are not lagging behind or even on the verge of a massive wave of change — as is often reported: they are fully immersed within it. Nearly all Canadian businesses (86 percent) told us they were currently experiencing or soon expected significant business changes. In fact, fully two-thirds of all Canadian organizations we surveyed indicated they expected or are experiencing changes to the strategic nature of their business. The concept of a “business pivot” is a daily reality facing many Canadian organizations. We know change is nothing new. But what is different about this go around is the pace of change and access to technologies that are facilitating this frenzied pace. Widespread digital technology and more data and analysis are injecting speed and stability into the natural desire all businesses have to keep pace. We see retailers that are better able to gain traction from technology changes by employing AI-generated data to see patterns in shifting customer needs. Or post-secondary institutions challenged by funding constraints using data analysis to implement technology based operational efficiencies in scheduling, programming, revenue opportunities and facility operations. Change is not creating an environment of fear in Canadian business – our survey found that businesses are overwhelmingly positive (78 percent) about their ability to grow and flourish from the current change climate.The attitude and approach of Canadian business to change is optimism and opportunity. Why is optimism high? In the private sector, where the competition is great, businesses see change as a competitive advantage. The current period of innovation is a proven opportunity to boost profitability ;embracing this opportunity is mitigating the fear and challenges of the unknown. In the public sector, where resources are notoriously tight, efforts are being put into becoming more efficient. Executive leadership’s investment in technology upgrades for service excellence and operational efficiencies has earned a high degree of support and buy in from public sector employees. Optimism aside, our survey found that there are still multiple barriers that organizations face in realizing outcomes from their transformation efforts. Nearly all business we surveyed (93 percent) faced barriers to the successful implementation of change. "Organizations expecting change need to be asking themselves frequently where they stand relative to their plans and looking a whether they can still realistically achieve their goals." To overcome barriers, you need to recognize that maintaining the status quo will not cut it in the short to medium term, let alone 10 years out. And to thrive and grow, you need to understand who you are as an organization and have a road map that helps you stays true to your core values as you implement change. Yet, only a quarter of the organizations we surveyed report that their business plans are up to date as of the last six months – a long time during these times of rapid innovation. Organizations expecting change need to be asking themselves frequently where they stand relative to their plans and is what they are doing now enough to realistically achieve their goals. The 12-month update cycle may have been the established organizational practise for many businesses, but many organizations are adopting a more agile approach to planning – this approach is more adaptive and evolutionary in the development of an approach or plan focusing on early delivery and continuous improvement and encourages a rapid and flexible response to change. It doesn’t need to be a whole-scale planning commitment every quarter, but for those areas seeing high levels of change – like technology, regulation, trade – you need to be looking ahead and rapidly turning your ideas and use cases into tactics and action to achieve results. Feeding into this compressed planning cycle is the need for more environmental scanning and self awareness. Preparing for change requires the ability to recognize what existing competitors and new entrants are doing and understand your own ability to adapt. Our survey found that only half (47 percent) of business decision-makers report their companies are proactive about evaluating their strengths and weaknesses on a regular or frequent basis. This lack of awareness is where many businesses could be at risk. Organizations often need outside help assessing the strength of their adaptive abilities – many organizations recognize that they don’t have the internal expertise or capacity to do so. Our survey showed that 94 percent of Canadian businesses facing a transformation have engaged outside assistance to help them navigate through change. Transformations can fail because organizations make incorrect assumptions – especially about their capability and capacity to undertake change. A regular analysis of your ability to adjust or adapt your plans is critical in today’s environment, given the pace of technology advancements and disruption. Frequent checking of your mirrors for new entrants to your market and new technologies will help you get ahead of them and identify new opportunities.